Tired of hearing those loud obnoxious sounds coming outside your AC? We don’t blame you! A faulty condenser fan motor: See the large fan when you look into the top of your outdoor unit? Well if the fan’s motor is failing, it can make a loud screeching/squealing noise while it runs. A broken compressor: The compressor is responsible for circulating refrigerant (the liquid/gas that cools air) throughout your home. If the motor inside the compressor is starting to fail, then it will sometimes create a loud screeching sound while the AC is running. A professional will need to fix or replace either your fan motor or compressor. Do you hear a loud banging/slamming noise? Your compressor support springs have worn out: Support springs provide balance to your compressor. But when they give out, they make the compressor lose balance as it slows down, which causes it to bang against nearby parts. The condenser fan is knocking against the unit: If parts are loose on the fan, it can knock against other parts of the outdoor unit, causing a loud banging sound. Both of these problems require a professional’s help to fix. If you hear a popping noise near your outdoor AC unit, you should turn off your AC immediately. A popping sound (like popcorn popping), is a sign that your compressor is sucking up the liquid form of refrigerant on the intake (suction) side. You see, after refrigerant absorbs heat from your home’s warm air at the indoor unit, it turns into a warm vapor (gas). This warm vapor is what is supposed to enter the compressor (located in your outdoor unit). 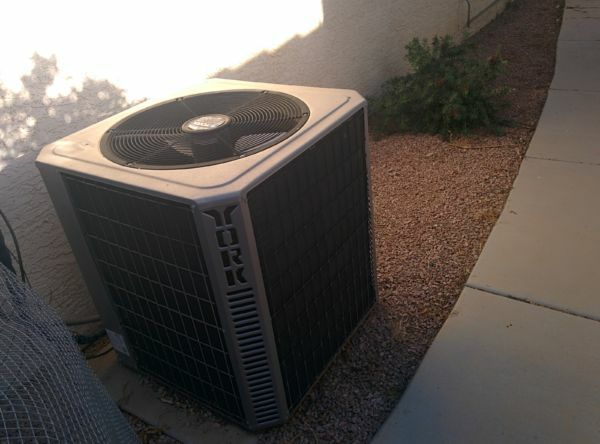 But if you have an AC issue that’s causing liquid refrigerant to enter the compressor instead of warm vapor, it could end up destroying your compressor (a very expensive AC component), so you should turn off your AC and call a pro to fix it ASAP. A loud buzzing sound is a sign you have an electrical problem in your outdoor unit. For all of these issues, you’ll need a professional to diagnose them and repair them. Do you hear a hissing noise in your outdoor unit? A hissing noise is most often caused by leaking refrigerant (the liquid/gas the cools your home’s air). Refrigerant is circulated throughout your home via copper lines that run in a closed loop, meaning you shouldn’t ever “run out” of refrigerant unless there’s a leak. When a leak forms in the copper tubes and refrigerant escapes, you’ll often hear a hissing noise caused by the change of pressure (think of air escaping a balloon). Need a San Marcos professional to fix your AC? No matter the loud sound you’re hearing, we can fix your AC so it runs quietly and smoothly again.